The new Channel Master DVR+ is a good value for the money. There are No subscription fees at all. The device comes with a premium program guide data from Rovi. The device also has a dual-tuner function, supports Vudu to rent movies from and the image quality is very good, unlike other devices that use compression. Here is a break down of the main features you should know about before buying it. The Channel Master DVR+ Bundle is designed to record free, over-the-air TV through an antenna. 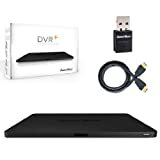 In this article we are going to review the channel master dvr plus and discuss the features, what it can do for you and what other customers have commented about it so you can make an informed buying decision to cut the cord with this dvr without subscription device. Cutting the cord or canceling your cable bill is a big deal and a bit nerve racking that you will have the right solution to get all your shows you love to watch. Figuring out all the pieces to get it done technically is challenging and a daunting task to say the least. Lucky for you the Channel Master + let’s you hit the easy button to accomplish a subscription free house hold. Over an extended use the Channel Master DVR+ has proven to be reliable. There is a 16GB of storage, built into the device which is essential for pausing live television and buffering. It has 2 HD tuners built into it, so you can watch a show and record a show at the same time. As of 8/24/2015 it will now work the slingbox 500 to give you more options to record and watch more prime time stations. By default you have the Vudo service option. You can optionally attach an external USB hard drive for more storage options and you can also attach it to other streaming media devices to get access to other networks like netflix, hulu, amazon prime etc…. It does not have that option built in. There is an rj-45 network connection available that you can attach the device to your local network. It would of course have to be close to a network jack or your internet router to run the network cable to it. This would get you access to various online services that you could watch more TV shows or movies. The design is stylish, flat and very discreet unlike most living room boxes. It is just thick enough to allow all the ports on the back. These consist of an HDMI output, antenna input, USB ports (2), Ethernet Port and an IR extender port. The IR-extender port allows you to conceal the device, by putting an IR extender cable in a position that can receive remote codes. However if the Channel Master DVR+ is on display it is so discreet it will bend in with most living rooms. The remote control that is provided is sufficient, although could be better. It is a full size clicker and has all the functionality of a DVR remote control such as: a guide, directional pad, DVR and playback features which include skip and jump back buttons. The downsides are the layout is not as well thought out as it might have been. Some buttons are awkward to use and are tiny. They are mostly of a similar size and very flat. This does integrate with their built in channel guide. So, any station that was picked up on your setup will be available in their guide menu to scroll through and channel surf like you are used to doing. You can pick up about 1-2 days worth of guide data over the air. If you want something more accurate use the network connection on the device to connect to the internet so it will get the more accurate data from channel vision servers. The Channel Master DVR+ does need a lot more setup than most gadgets. The first thing you’ll need to do is connect the antenna which is not included to a position where you can get a decent signal. Then you’ll need to do a channel scan which can take up to four minutes. Optionally, you’ll need an external hard drive which needs to be connected by USB. Lastly, you will need to get the DVR+ online. Internet connectivity isn’t essential, but recommended. The device can use the included program data with terrestrial broadcasts, but if you go online you get two weeks of data from Rovi for free, no monthly fee. Rovi’s guide data is more accurate and is worth the trouble of getting the DVR+ online. The remainder of the setup is straightforward and takes less than 10 minutes. The Channel Master DVR+ records free TV without the need for subscription. The DVR+ provides a free Rovi program data guide. Vudu function is supported allowing access to streaming movies, prime time TV stations and a pay to view basis. It should be able to get all of the major networks as well as PBS and other stations. However, the reception may vary considerably, depending on your location, antenna and the weather. Vudu lets you use a large library of movies and TV shows. You only get pay-per-view though. Overall I did not find any negative comments about the device. As you read through the reviews on amazon everyone was happy with the unit and it worked out of the box as expected. I did notice that they added 30 plus channels now that you can view and they continue to do that. One of the customers did point out that your Over the air antenna is key to getting your local shows. Some of you will be in a bad position based on where your house is located. See if you can find your local tv stations website to get an idea of the range they broadcast their HD programming over the air. That will help you pick out the right hd antenna. There were complaints about the remote being too small and not lighting up at night. They have released a new version of the remote this summer to fix that issue. I did see people asking for an integrated approach to have access to hulu plus and netflix. At the time of this writing you still need an external streaming device to get access to them. The device doesn’t include Wi-Fi adapter which means you will want to hook into a device like a Roku to get access to other streaming online services. Overall the Channel Master DVR+ delivers on the promise of an over-the-air DVR+ without any subscriptions. Note: You can purchase an optional USB wireless adapter for it now in 2017. The DVR+’s channel grid has a familiar layout that is easy to navigate for most users. This is a plus as any similar devices have a poor onscreen interface. There are some niggles, however. If you select a program from the grid that’s currently on, you won’t go straight to the live feed; instead, a prompt asks if you want to watch it now or record it. It’s a minor inconvenience and everything takes a few more clicks and searches than you might expect.